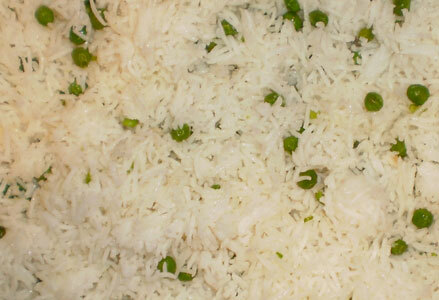 Bagghar chawwal is a seasoned rice usually served as a main dish in Indian subcontinent. This seasoned rice dish is more popular among Musilms and often served with Yakhani, a mutton meat. However, Bagghar-E-Chawwal can be served in place of rice in with any curry, dal or meat dish. 1 Slice the onion and cook until golden brown in oil or margarine. 2 Add rice, garlic , ginger and salt. 3 Cook until light brown in oil with continuous stirring. 4 When rice mixture forms lumps, add water. 5 Lower heat and add cloves, cardamoms and cinnamon sticks. 6 Cover and cook until tender. Optional garnish with cooked green peas.